The other day I was chatting with a friend and we were running over some trendy apocalypses. There’s the ever popular zombie apocalypse. I discounted it, but he had an idea. He thought by the end of the year Israel might attack Iran in an effort to postpone the day when Iran would be able to make a nuclear bomb. Who knows what weapons Israel might have? I reluctantly recalled that some years ago the US developed a sub-sonic transmitter that would put out a sound wave tuned to the natural frequency of your petrous pyramids, the bones that surround the auditory and balance sensors in your head. Giving them a good shaking up would render you deaf, give you a sensation of chaotic spinning and leave you too busy vomiting to do much else. A single second pulse would quell a riot. There was a suggestion that it was given to Israel on the promise, as was promised with the cluster bomb, that they would not use it. There was a brief rumor that they had used it for a pulse rather longer than originally intended. Maybe that could make survivors act like zombies. It seems about as likely as any other source of zombies, but there you are. Then there was the Mayan Apocalypse. It has been debunked so often that people seem actually to be losing interest. There are some amusing correlations you can make, but in the end it’s just the end of a calendar. Do you remember Y2K? Computers were originally only able to keep track of years up to 99. Who knew what would happen when year 2000 came? Well it wasn’t the apocalypse, anyway. I promptly discounted one of my own favorite: when the Arctic Ice Cap is gone, there will be a huge thunder storm over the Arctic Ocean. The jet stream will stop. Hail from the storm will lay down glaciers overnight. 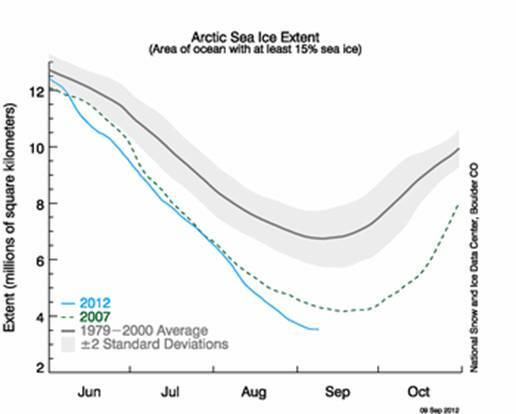 I told him I was no longer worried because the ice cap was already so far gone we would have had warnings. But there is one other thing that doesn’t need quite so much guesswork. At the height of the melt each year the remaining ice winds up attached to the islands of northern Canada. The Northwest Passage among the Canadian Islands is in fact iced up just now. The Northeast Passage, clear water from the North Atlantic across the top of Siberia to the Bering Straights and North Pacific, is wide open. The question is what happens when the ice cap breaks loose from its attachment to Canada? Now you have a huge ice raft with no way of knowing what direction it’s going to go. The beast has never been free before. And by right it should not happen. 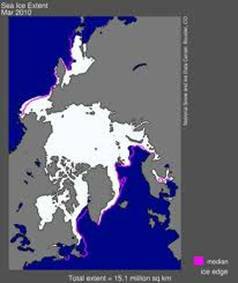 The ice should continue to retreat along the same lines until it is quite close to Canada. Or so I thought. But later I read an article (Banyan Snow Dragons ECONOMIIST vol. 404 no. 8800 September 1, 2012 page 46) that avers we will wait for no such event. It is already anticipated that the ice will be thin enough for giant icebreakers to go right up to the North Pole and over. Isn’t it amazing? 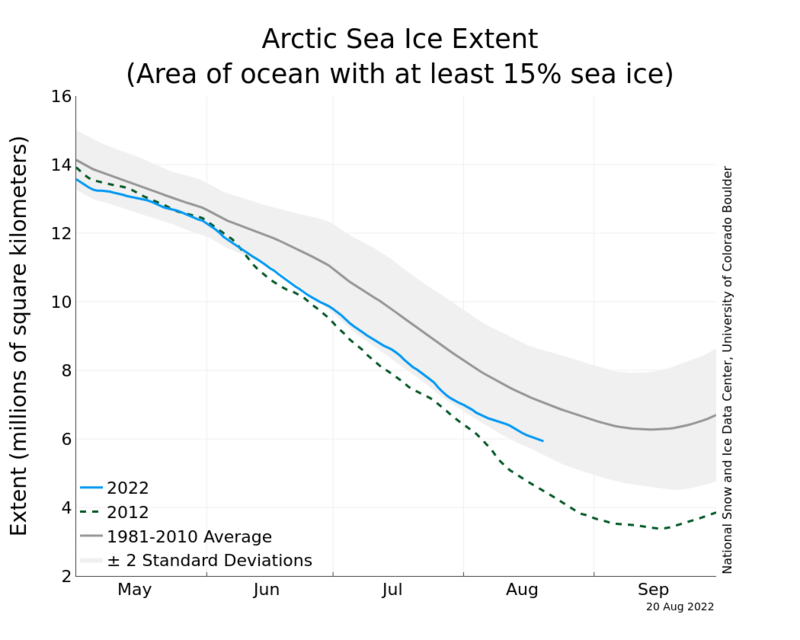 Not that long ago explorers faced a serious risk in the Arctic that their ship might be caught and crushed by the ice. Now the ice faces a high probability of being crushed by a ship. So that ice raft is going to be set loose one day in the not too distant. http://www.google.com/search?num=10&hl=en&site=imghp&tbm=isch&source=hp&biw=1189&bih=452&oq=winter+arctic+ice+&gs_l=img.12...2969.7656.0.10000.18.9.0.9.2.0.94.704.9.9.0...0.0...1ac.1.QpCQcketq1M&q=winter%20arctic%20ice downloaded September 10, 2012. Then the article from which the first two images came mentioned quietly that at last part of the reason for the extreme melt this year was a cyclonic storm that broke up a lot of the ice. Wait. Driver! This is my stop! I want to get off! A cyclonic storm? In other words a huge thunderstorm? That’s just what I thought hadn’t happened or people would be talking about nothing else. But if it’s real, then the jet stream must be slowing. They hadn’t told us that either. So I would suggest that if you can do it, plan a vacation late next summer as far south as you can manage. In a year we should know a lot more about whether this is really accelerating or an extreme fluke. There have been 67,585 visitors so far.